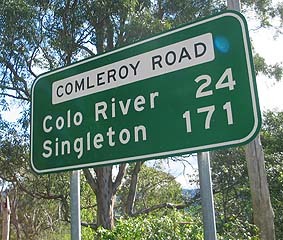 Comleroy Road originally led all the way from the Hawkesbury through Putty to Comleroy in the Hunter Valley. This was Australia's first road north, opened in 1823. The Comleroy area in the Hunter, with all its various spellings, 'gave our first road north one of its original titles,' notes HA MacLeod Morgan. Ref: 1958, Royal Australian Historical Society Journal and Proceedings, 44:196. 'Comleroy' comes from the Aboriginal word 'Kamilaroi', the name of the Kamilaroi Nation or Kamilaroi people of the Hunter. By the late 1800s, Comleroy Road became a designated stock route north for both cattle and sheep. The government created many travelling stock reserves along the road, no more than ten miles apart so that the stock could rest and the drovers could camp at night. 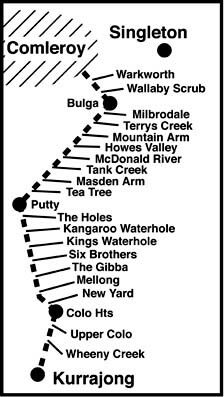 There were a large number of Travelling Stock Reserves along the original designated stock route of Comleroy Road between Kurrajong and Comleroy in the Hunter. © 2005. comleroyroad.com . All Rights Reserved. A site on the history of the Comleroy Road.